Patents lie at the heart of modern competition policy. In the new economy, firms use them variously to protect their R&D, to bolster their market positions, and to exclude rivals. Antitrust enforcers thus scrutinize patentees to ensure that they do not use their intellectual-property rights to suppress competition. Today's antitrust lawyers must therefore navigate intellectual-property issues and advise clients on the procurement and assertion of patents. It is no easy task. In granting exclusive rights, patents have an uneasy relationship with competition law, which struggles in turn to apply policies developed in bricks and mortar industries to the world of technology. 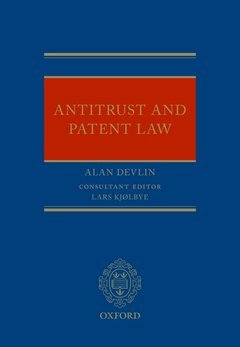 This book explores the acquisition and use of patents under the law of the world's two most important antitrust regimes: the United States and the European Union. It examines antitrust rules governing technology transfer, standard-essential technologies, patent aggregation, open and closed systems, coercive licensing terms that amount to misuse, evergreening tactics in the pharmaceutical industry like 'paying for delay', and patentee immunity in suing for infringement. To contextualize that analysis, the book explores the theoretical relationship between patents and competition law, addresses the U.S. 'patent crisis', the move towards unitary patents in Europe, and differences between the US and EU competition regimes. Further, the book explores idiosyncrasies governing the core antitrust questions of market definition, market power, and anticompetitive conduct in the patent setting. In doing so, the book allows those who practice, enforce, teach, or study competition law to understand the subtleties of this fascinating subject.